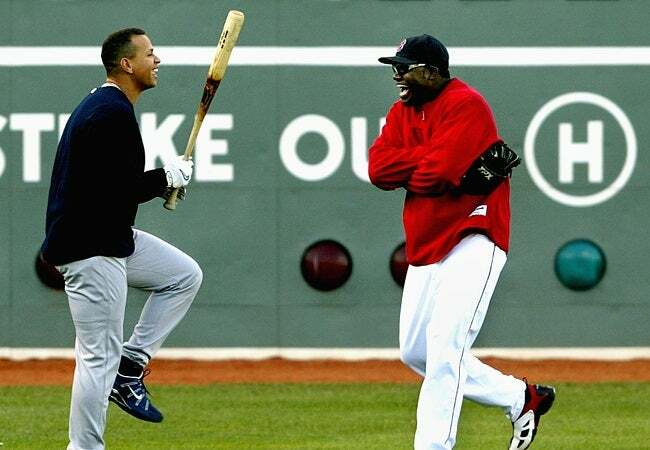 By now you probably know that Boston nemesis Alex Rodriguez hit home run No. 660 into the Green Monster seats Friday night to tie Willie Mays for fourth place on MLB’s all-time homer list. The eighth-inning home run shot by A-Rod was caught by Red Sox fan Mike Shuster, who immediately indicated that he was not going to give the ball to Rodriguez. According to the New York Daily News, Shuster was unwilling to negotiate with one of the Yankees security staff who was attempting to get the ball back to Rodriguez. A member of the Red Sox security staff then offered Shuster several Ortiz-signed souvenirs, but was rebuffed. Ortiz said the fact that the home run ball came off the bat of the controversial Rodriguez has nothing to do with his feelings on the matter. A-Rod’s 660 home run ball might fetch $15,000 to $20,000 on the market, Dan Imler, vice president of SCP Auctions, told CNN. The California auction house previously sold A-Rod’s 500th home run ball for $105,000. That was an 80 percent drop off the No. 500 home run ball from 2007. “It’s obviously a fraction of what it would be if it wasn’t shrouded in controversy,” Imler said. The controversy stems from the fact that A-Rod is coming off a 162-game suspension for his involvement in the Biogenesis PED scandal. In an interview with Ken Rosenthal of Fox Sports during spring training, Ortiz spoke about his relationship with Rodriguez, who was previously a good friend, but whose attorney implied on the radio last year that Big Papi was also a player who, along with A-Rod, also used PEDs. “I’ve got no problem with Alex. I think the guy needs to, I guess, have better people around him, or better people doing things for him. He’s not a bad person,” Ortiz said. “I think the decisions that have been going on, the people around him who have been making decisions, have put the guy in a bad position. Shuster remains undecided on what to do with the baseball and is considering options from donating it to the National Baseball Hall of Fame to blowing the ball up and recording the event on YouTube. Shuster has started a Twitter account, @ARods660hrball, asking fans for ideas on what he should do with the baseball and pitching his story to television shows around the country. Meanwhile, A-Rod and Yankees also continue to battle over a $6 million milestone bonus related to hitting the historic homer.